I think it’s time for another round of FAQ’s, don’t you? Here we go! Your hair looks so good! Are you going to keep it short? If I had a dollar for every person who has told me I should keep my hair this short… well, I wouldn’t be rich, but I could at least buy a nice sweater or something. I appreciate the compliments and everyone’s fascination with my hair growth process. However, I have no intention of keeping my current boy-cut. Having your hair fall out is totally traumatic. Having your hair grow back is totally awesome. I want it to keep growing. I have frequent dreams where my hair is suddenly long again. I look at old photos constantly and lament the loss of my long hair. So although this short “style” (if you can call it a style) is extremely low-maintenance, and perhaps one day I’ll go back to it… it’s still not me. It’s not my choice. And it still reminds me of cancer. So everything’s good now, right? You feel good? I never know how to answer this one. Yes, I feel pretty good, in comparison to how I felt when I couldn’t walk up a flight of stairs or raise my arms or sit up without assistance. It’s hard to complain about anything when I know what it really is to not feel well. But if you want to know the truth, I’m not just “fine” and “all better.” I still suffer from fatigue all the time. I often hit a wall in the late afternoon where I feel like I need to lie down and nap. I try not to plan more than one “exhausting activity” (such as grocery shopping) per day, because sometimes I can’t keep up. I have side effects from my drugs. Sporadic bone or joint pain. Headaches. Pelvic pain. Hot flashes. The constant drip of my nose. Tightness around my implant where I received radiation. Lots of little reminders, scattered here and there. So yes, I’m feeling pretty great, and thankful every day for my health. But it’s not perfect. And it probably won’t be for a long time. You’re all done with treatment now, right? Oh my gosh, you guys! Don’t you read this blog? I am totally NOT done with treatment. Every three weeks, I continue to check-in at chemo daycare and wait around 1-2 hours to begin my treatment. My port is then accessed with a needle and hooked up to an IV. It’s injected with saline, which leaves a gross taste in my mouth. Then I receive my medication for the next two hours. Then I go home and feel tired. I have been doing this for a year. And I am ALMOST done. In fact, Jan 31st should be my last trip into Chemoland, if you want to mark it in your calendars. That phase will be over, but I will still be taking my Tamoxifen each and every night and dealing with its thrilling and varied side effects (see above) for a looooong time. But it’s all a small price to pay for the chance to live, in my opinion. Did you ever end up catching that mouse in your house? No! The little guy is super sneaky and exceedingly intelligent. We have had a few sightings and have set up a variety of traps. Somehow, he is not falling for any of it. He knows what’s up. So for the time being, he is living with us. Really, he’s an ideal houseguest, as he mostly keeps to himself and stays out of sight and doesn’t ask for anything. But unfortunately, unlike with our other houseguests, our goal is still to murder him. Sorry, mouse. It’s a cruel world out there. As I have learned time and time again, sometimes life just ain’t fair. 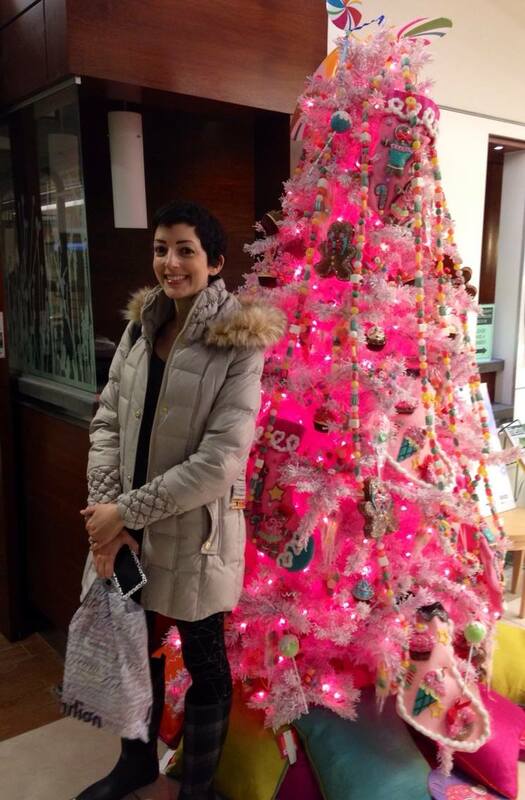 Last week pre-treatment in the waiting room. The christmas tree was pink and adorned with cupcakes and candy. Now that’s my kind of tree. Merry Christmas! Have you tried peanut butter with the mouse traps? That always seemed to catch mine, they loved it (which makes me feel a little guilty for using it, but it was them or me). You are as beautiful on the inside as you are on the outside. Great post!!! Lot’s of clarity!!! Happy New Year to you and your family!! I am wishing only the very best for you and all your loved ones in the coming year!!!! I was going to write a similar post over the holidays, but once again, you said it so much better than I could that I just posted a link to your post on my FB page! Dr isn’t concerned and seems so common yet no one can tell me why or what it is that makes any sense! Hi Becca, it feels like really bad painful cramping. Hard to stand up when it happens, I usually have to take advil and use a heating pad and wait a few hours for it to pass or fall asleep. I also do have pain sometimes in my hip… who knows what it’s all from!